We heard from Nancy Dingus in "Favorite memories" from the June 30 Fanfare. Further correspondence resulted in the following about touring with Freelancers. My son Bo, (who's legally Robert but has never been called that except by a formal second grade teacher), was converted to drum corps by a group of drum corps fanatics when he was a high school freshman. He marched with the 1982 Kingsmen and wore DCI Hall of Fame member Tom Float's old cadet uniform. I spent a couple of weeks with the corps at the end of the season, doing typical "mom" stuff from Boston to Montreal and then on the trip home. I've made the trip between Boston and Montreal at least three times, and as far as I know, New England is a dark blur just past the painted line that edges the shoulder of the road! Bo, who played contrabass bugle, has a music performance degree (in bass trombone) from University of Nevada, Reno. And he hopes to participate with the "xkingsmen" alumni corps in Pasadena. Bo ended up going to Sacramento with some Kingsmen buddies in 1983. I ended up going along for the last couple of weeks on tour as a "cook's helper," when I was paid all of five dollars a day! I've never sweated the way I did in Miami! Nor have I ever been in a less friendly environment. I joined the corps in Atlanta and went through the other Florida shows before Miami and again, riding the bus home. (Sidenote: It was a show in Tampa/St. Pete where Bridgemen first tried their blindfolded drum line. That's my all-time favorite drum line!) At that time, Freelancers' chief cook (and unofficial tour manager) was a man named Bram Lambrechtse, who deserves a column as one of drum corps' greatest fans. At some point, I promised Bo I'd find a way to go along for the whole "big tour" (as opposed to the early-season tour around California). I arranged for that in 1984, starting the tour as "cook's helper" again. I was asked to help with uniforms somewhere in Utah, which I did for the rest of tour. After an all-night effort to get all the uniforms looking spiffy for the Semifinals competition in Atlanta, Freelancers' performance was hit by torrential rain. My main memory is that all the "pigeons" (the shako plumes) drowned as they soaked up the rain! By 1985, I regularly attended Freelancer rehearsal camps in Fresno, Calif., and worked with Cindy Marvelli on those interesting, Velcro-encrusted uniforms. Again, I rode along for the whole tour, and was making the same uniform repairs on the way to the DCI World Championships that I had started doing in about February! Bo has a pathetic story about being on the field at Camp Randall Stadium. At the "horns up" command, his cross sash and Freelancer silver buckle fall off. A judge picked it up for him, and made some commiserating comment. Bo's reply was along the lines of, "You have no idea!" Cindy and I called ourselves "Marge and Alice," although we never decided who was who. Always making sure that everyone's uniform was in top shape, our slogan was, "Marge and Alice never let anyone march in their underwear." We always dreamed of obtaining matching bowling shirts with that slogan! In the early season, before tour started, I sometimes visited Velvet Knights rehearsals, and helped sew the sequins on their chino pants. Up until May 1986, I was again attending Freelancer camps and working on uniforms. At the time the corps folded, I had a houseful of uniform parts. Shortly after receiving a call from Don Silva that the corps was folding, Bo received another call from Wayne Downey, inviting him to attend a Blue Devils rehearsal camp. So, Bo was a member of Blue Devils in 1986, 1987 and 1988, when he aged out. During that period, I hung out on some of the Southern California tours, and also at the DCI World Championships. I did not have any sort of even semi-official role, although in 1986 and 1987, I rode home with the corps. 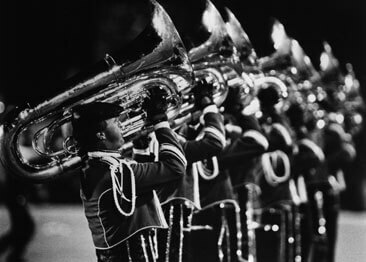 In 1986 and 1987, I also tried to help with uniforms, and had one experience when corps director Mike Moxley asked me to take a marching member to the emergency room and then get him to the show. The poor kid was worried about not having enough time to get into uniform, and I kept saying, "Marge and Alice don't let anyone march in their underwear!"